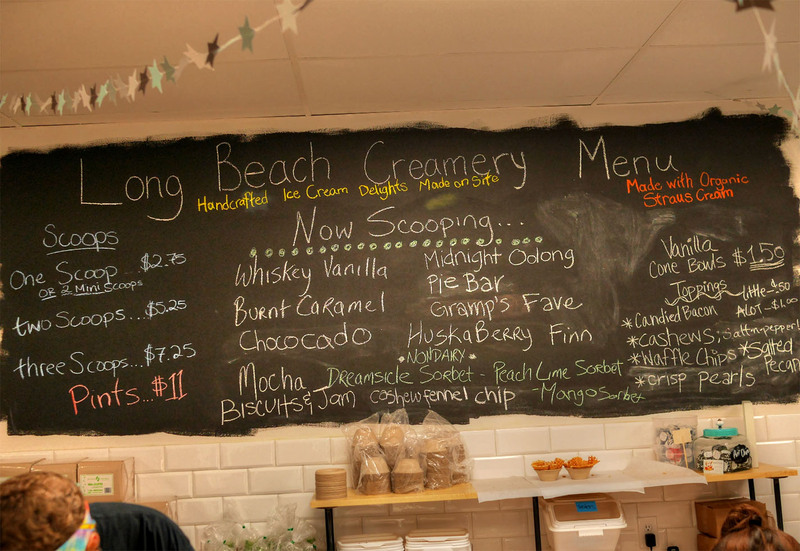 After a promising dinner at Adobo Taco Grill, dessert was in order, so we headed over to the newly-opened Long Beach Creamery. 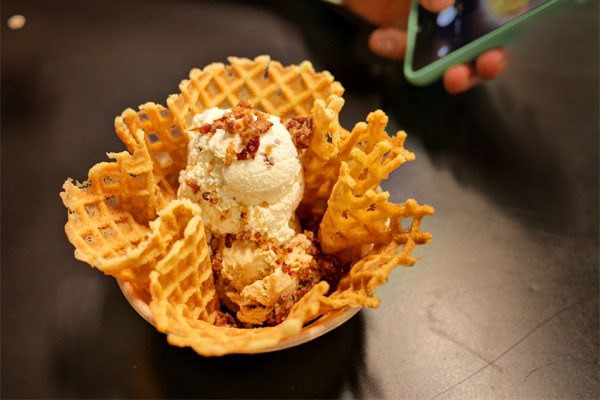 LBC was founded by one Dina Amadril, who was inspired to start experimenting with ice cream after tasting neighbor Sasha Kanno's peanut-based creation in June 2013. That August, she held her first tasting at her home, and subsequently continued to hold such tastings at Kanno's Farm Lot 59 urban farm in order to raise funds and garner interest. At the start of 2014, Amadril started looking for a location for her shop, and ended up signing a lease in August. In November 2014, she launched a Kickstarter campaign to aid in the build-out of her dairy room. The effort ended successfully, raising over $24,000, and the shop finally ended up debuting on May 17th this year. LBC occupies the former home of Philly Steak & Sub, and inside, things are about what you'd expect. There's minimal seating indoors, but a good amount outside. As far as the menu goes, you get a choice of a dozen or so Straus Family Creamery-based ice creams as well as sorbets. 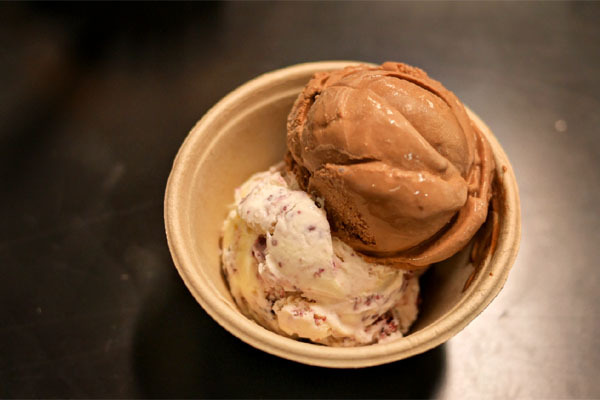 Options include a vanilla cone bowl for $1.50 and a variety of toppings. Click for a larger version. We opted for three sets of two mini-scoops. The Cashew Fennel Chip was one of my favorites, nutty at its core, but with a delightful fennel zip toward the back end. Burnt Caramel, meanwhile, was much more intense, with a palpable smokiness set against a backbone of caramel-y sweetness. 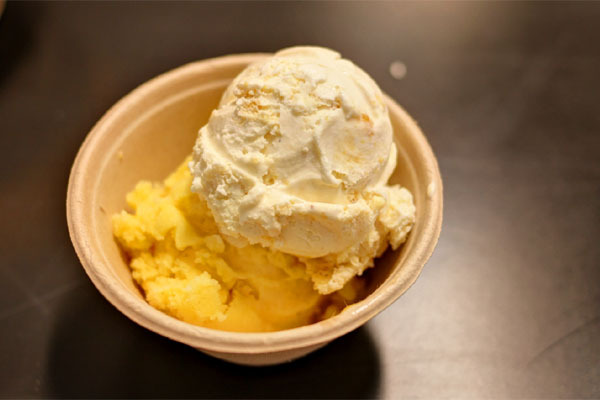 I was a big fan of the cone bowl as well, which provided a wonderful hint of vanilla, and more importantly, textural contrast to the ice cream. The Midnight Oolong was a smart take on your traditional chocolate, with its classic flavors tinged by just a touch of tea astringency. On the bottom came the Pie Bar, made by smashing actual whole Marionberry pies into Tahitian vanilla ice cream. Great base of vanilla flavors here, with the tart, fruity berry working as a delicious accent. 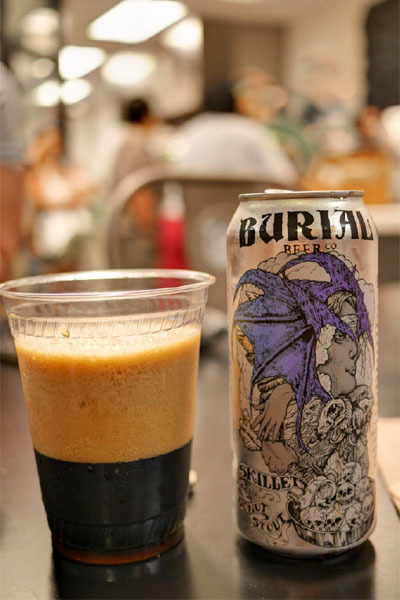 We were able to sneak in an appropriately dessert-y beer, the 2015 Burial Beer Skillet Donut Stout, a breakfast stout made with a blend of nine barley malts, oats, milk sugar, and Counter Culture coffee beans. Really strong, bitter aromas of coffee here, leading to more of the same on the palate, joined by rich flavors of malt and dark chocolate. The Biscuits & Jam was another favorite of mine, thanks to its juicy stone fruit flavors and large, satisfying chunks of buttermilk biscuit. Last up was the Dreamsicle Sorbet, a reasonable approximation of a Creamsicle bar that intermixed tart citrus with an appropriately creamy component. I wasn't expecting too much coming into LBC, but left quite impressed. The flavors showed off creativity, and taste-wise, things were robust and not shy at all, yet at the same time refined, finessed. As one of my dining companions alluded to, this is probably the closest we're going to get to Sweet Rose this side of the 91.